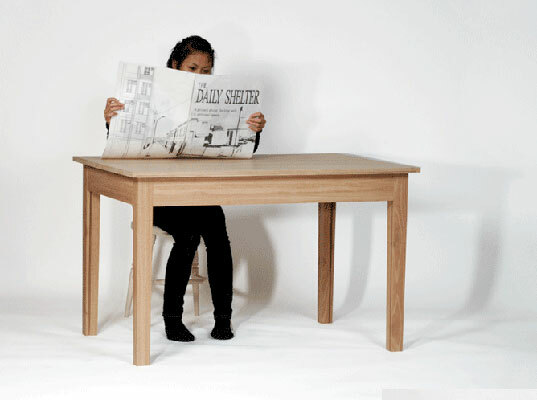 Daily Shelter: A Kitchen Table That Transforms Into a Playhouse! As far as transforming furniture goes, this table-turned-playhouse by Ingrid Brandth is nothing short of spectacular. (Watch the video below the fold if you don’t believe us.) An ordinary-looking kitchen table at first glance, the Daily Shelter can be converted into a tiny house in seconds by pulling down hidden panels to form walls and then raising the roof (literally!) by pushing up the table surface. Camped inside, a child can “hide from scary sounds, ghosts, or family members,” says Brandth, who adds that the playhouse imparts the same sense of security that a snail feels in its own shell. Cozy! Clever idea, especially good to keep the table clear! :-) I would have appreciated windows though, and a video of the UNfolding! As far as transforming furniture goes, this table-turned-playhouse by Ingrid Brandth is nothing short of spectacular. (Watch the video below the fold if you don't believe us.) An ordinary-looking kitchen table at first glance, the Daily Shelter can be converted into a tiny house in seconds by pulling down hidden panels to form walls and then raising the roof (literally!) by pushing up the table surface. Camped inside, a child can "hide from scary sounds, ghosts, or family members," says Brandth, who adds that the playhouse imparts the same sense of security that a snail feels in its own shell. Cozy!